When it comes to the perfect crossover between hard-wearing and handsome, nothing beats wooden garden furniture. Durability is key when it comes to choosing outdoor furniture, of course, and if you’re the sensible sort, it’ll probably be the first thing you consider. But looks have an important place in our wish list, too. In celebration of this marvellous material, we’ve selected the best wooden outdoor furniture in the shops right now to add a bit of pep and practicality to your patio or deck. Despite its hard exterior, even wood needs a little love now and then, so be sure to give your furniture a seasonal clean at the end of the summer, and treat it to the occasional coat of wood oil or preservative to keep it sweet over winter. It can also be prone to warping or splitting in reaction to changes in temperature, so be sure to check the manufacturer’s care instructions for more in-depth advice, lest your cups and cutlery go sliding all about the place come next summer. Our first choice is a lounge set from Made that’s stylish, well-built and pocket-friendly, the holy trinity of virtues for outdoor furniture, but don’t let that fool you into thinking it’s all rattan armchairs and dining tables. 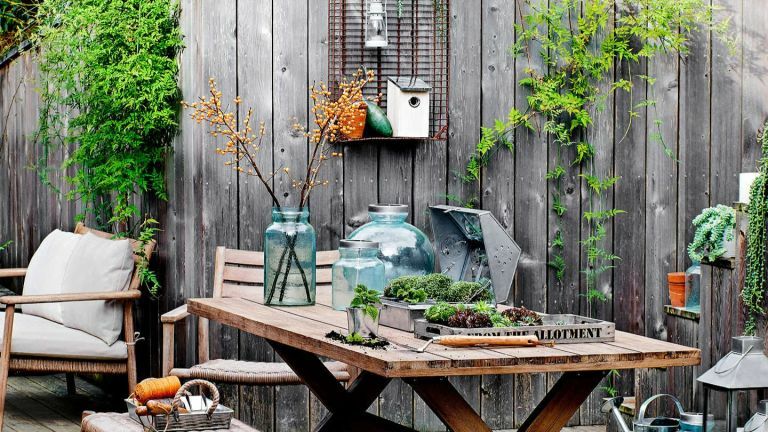 There’s storage, planters, benches and more, so read on to find your new favourite addition. For more know-how, find out how to choose garden furniture and check out our garden hub page. Okay, it might seem like a slight cheat, but hear us out: our first choice patio set is remarkable in that it combines wood (polywood, to be precise) and powder-coated iron to perfection, for a blend of beauty and durability that’s exactly what we want from our garden furniture. The slatted wood and white-toned hardware gives a beachy Cape Cod vibe, while the sleek, open design of the arms and legs cut back on bulk for a design that gives the illusion of more space, ideal for smaller patios. This six-seater dining table is made from FSC-certified teak. it’s a superb addition to the deck, with its sturdy, traditional rounded design and natural finish. It’s worth noting that made from teak, this table is quite resistant to adverse weather, but it's still sensible to store it indoors over the cooler months, and it’ll reward you with a table that the whole family can enjoy. Another fun take on the park picnic bench for home use, this Mead bench set from MADE takes the traditional slatted top and mixes it up a bit for an almost mid-century-modern look. The rounded edges on the table top and benches are a surprising comfort feature in the realm of garden furniture, and give the set a quirky look when not in use, while the contrast metal legs in a choice of on-trend teal or classic white keep things fresh and unexpected. A great alternative to a traditional table for modern gardens. Many of us are turning to container gardening as a means of adding colour and life to our gardens without the bother of borders or beds, and this wooden planter is a wonderful way of going about it. Sturdily made from solid wood, the Rowlinson planter has been pressure treated to resist rot and stay strong in the face of adverse weather, and is deep enough to play host to herbs, fruits or vegetables as well as flowers for a simple way in to growing your own. As well as acing the traditional look we love in a classic outdoor furniture set, this package of dining table, six chairs, and seat cushions represents phenomenal value. If you’re being careful not to overspend in the garden but have already gone way over your rose budget (guilty), buyers have found that this eucalyptus hardwood dining set takes some beating for its durability, comfort and ease of assembly, and we love the little touches that belie the small price, like the cut-off corners and plush holly green cushions. You might not think there’d be much you could do, design wise, with garden storage. But think again, because Cox & Cox have come up trumps with this gorgeous unit. They say it’s suitable for indoor or outdoor use, but we think its sturdy build and natural materials would make it look right at home outdoors, storing wellies, pet paraphernalia, or anything else you can imagine. Wherever you put it, the combination of natural spruce, with its sun-bleached look, and the industrial-looking galvanised lid, is utterly swoon-worthy.